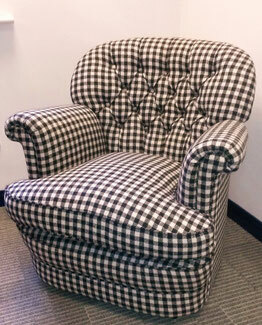 Sourced by my client this is a Hamptons of Pall Mall armchair. 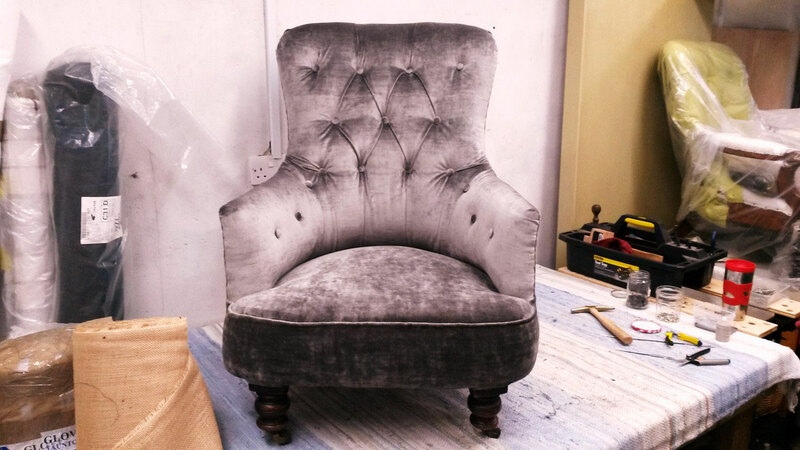 Stripped back to reveal a beautifully constructed frame and then completely traditionally rebuilt. 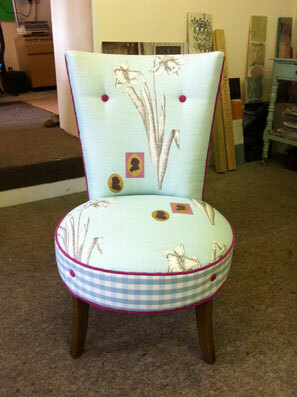 Sprung seat and back, new stuffing and feather cushions. 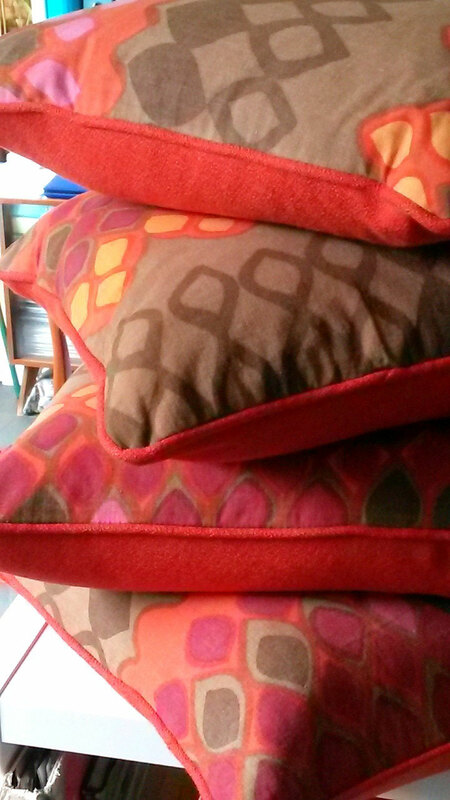 Lots of hand sewing!! 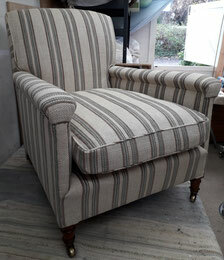 Covered in Burnham stripe by Colefax & Fowler. 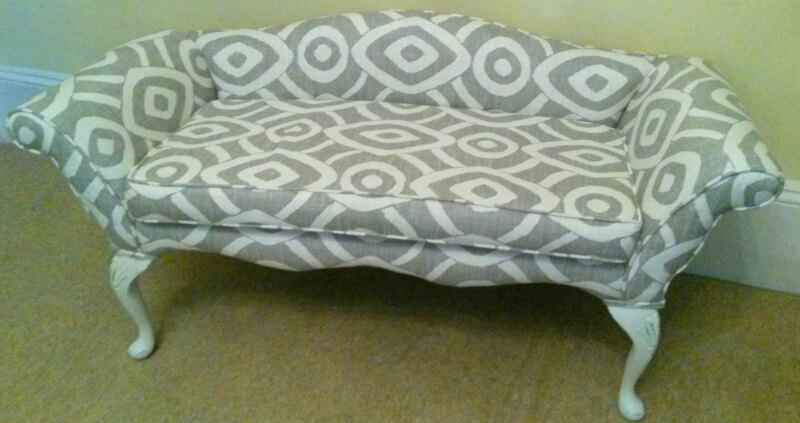 A large daybed chaise, fully sprung base with bolster end. Re-covered in Designers Guild Cassia velvet in Acacia. Fitted along end of clients bed ..... very lux! 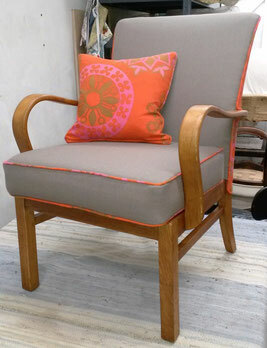 Mid-century open armchair sanded back, stained and oiled. 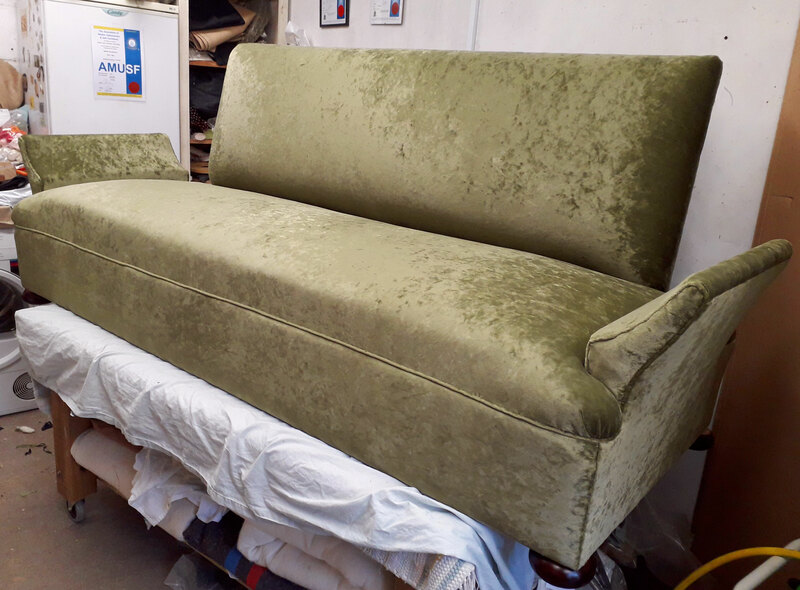 All new upholstery and covered in the most gorgeous emerald green silk velvet. Pair of 1976 Gomme chairs, restored chrome, teak arm rests and reupholstered in BUTE Fabrics wool tweed. 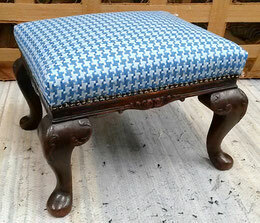 Traditional footstool reupholstered in houndstooth check and close trimmed with upholstery nails. 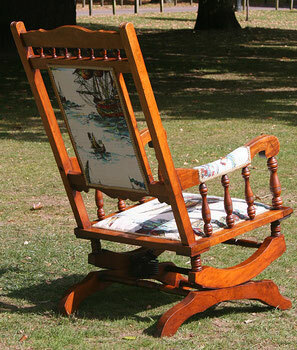 Lloyd Loom rocking chair painted with Old White chalk paint and waxed. 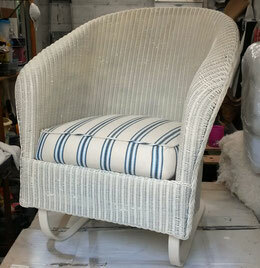 Vintage striped heavy weight linen used on seat. 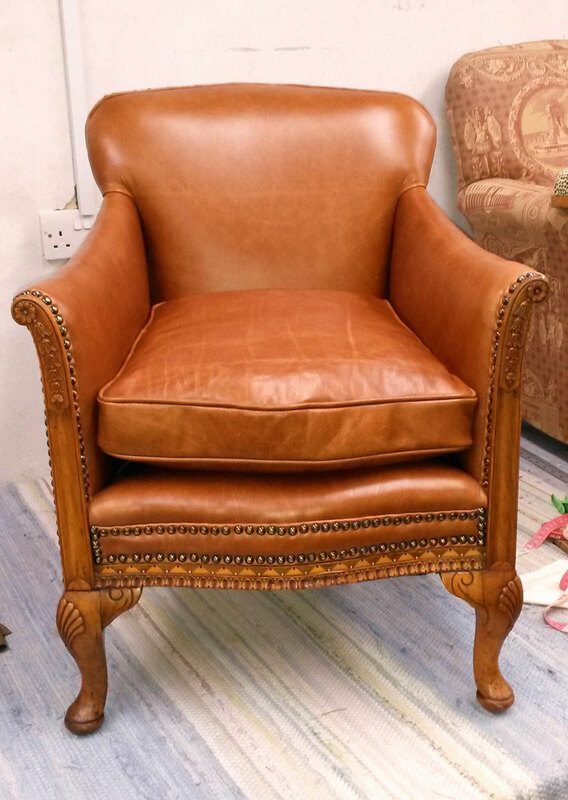 Beautifully carved open arm chair. 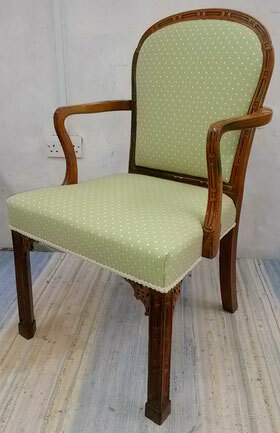 Revived and re-upholstered in pale green with cream trim which really set off the colour of the wood. Known as Bertie Bassett this traditional armchair has been completely rebuilt using traditional materials and methods. 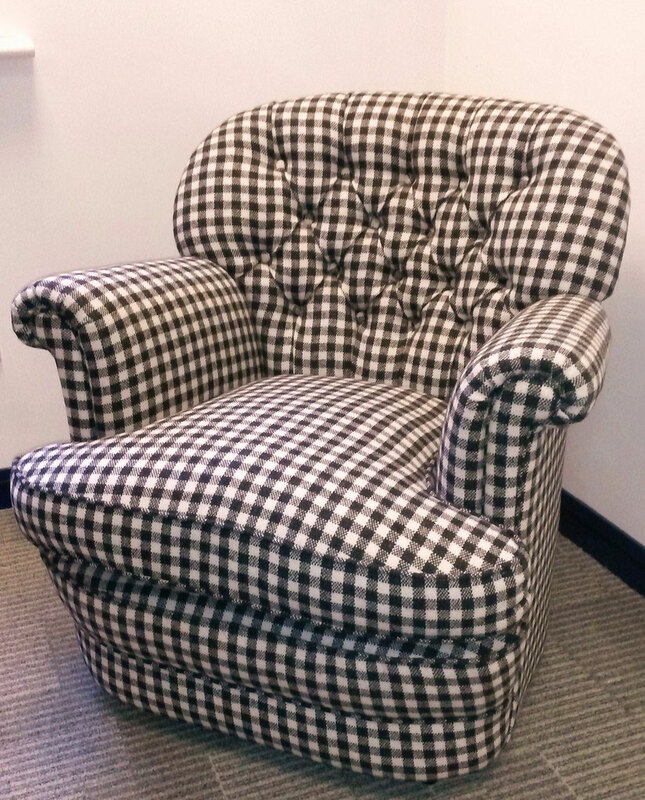 The wool check fabric is by BUTE and makes quite a statement! Just look at the curves on this armchair! 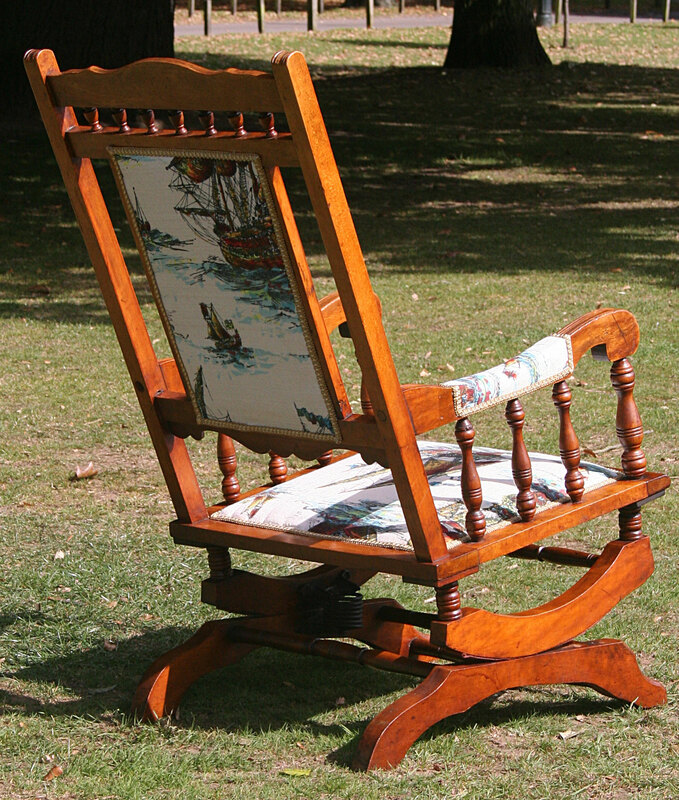 A long low seat with scroll arms and back. 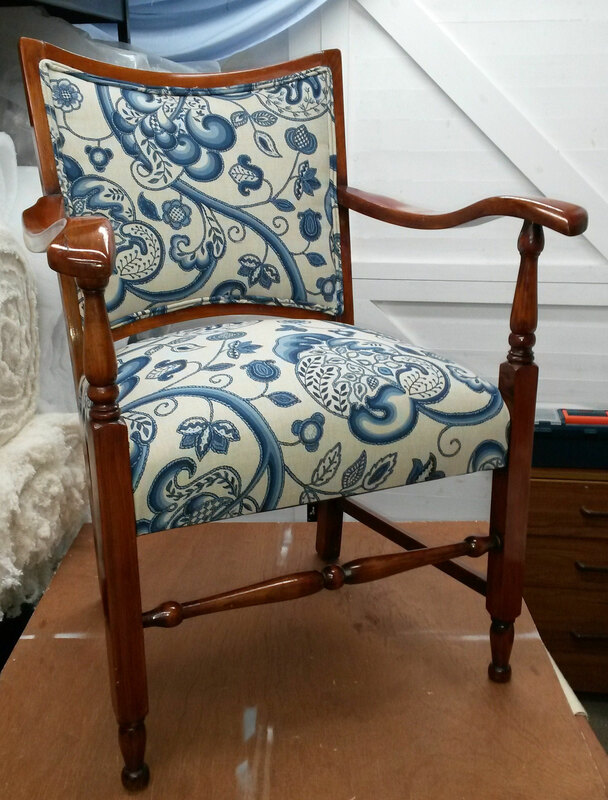 Again a complete traditional rebuild and covered with Theo velvet from Colefax & Fowler. 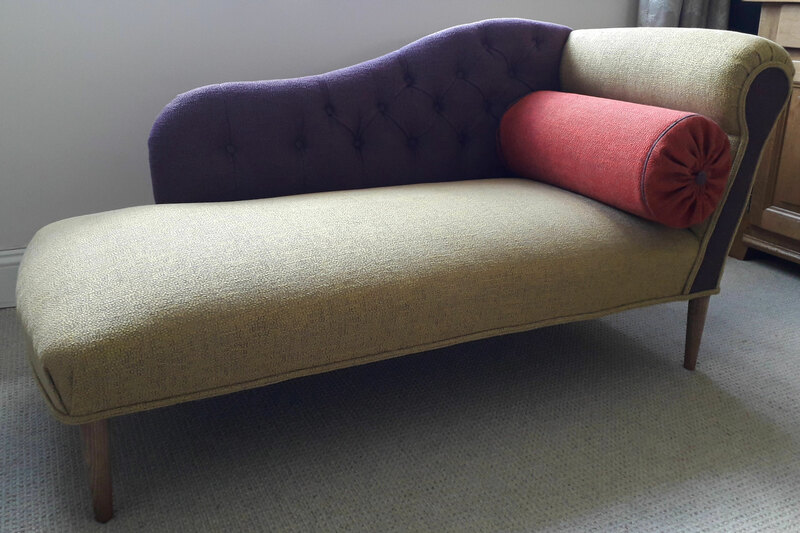 Bespoke Chaise with bolster built from frame up to clients spec using cone springs, rubberised hair and cotton/wool felt. A trio of colours in a textured slubby weave from Osborne & Little Antibes range brought it all together. 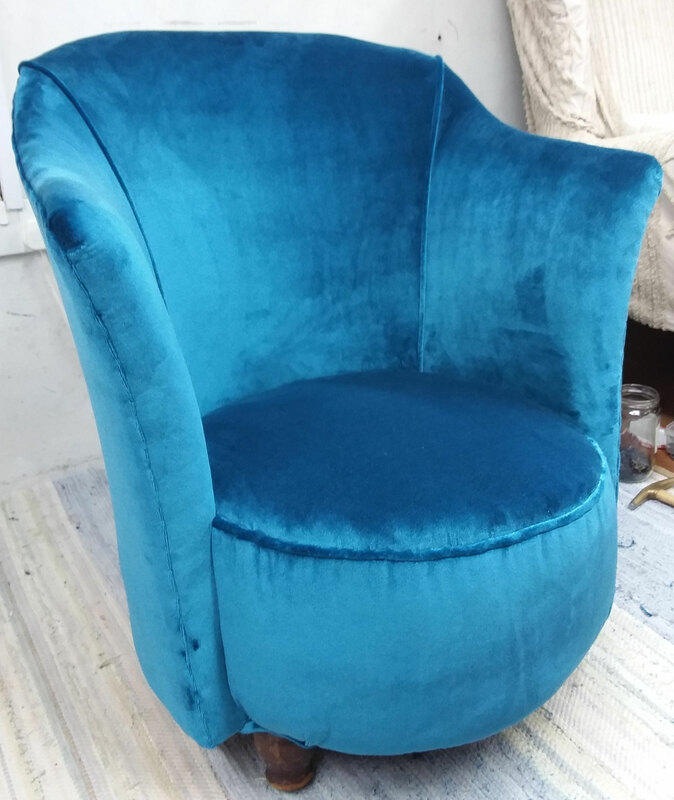 Teal velvet from Designer Guild now covers this unusual 1950's tub chair - again completely rebuilt and that drum seat.... emmm not easy! 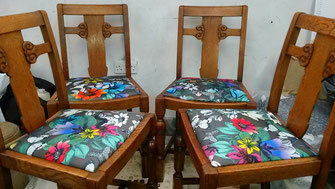 Set of 4 G Plan Butterfly chairs - backs revived and seats reupholstered (extra padding!) and covered with Wemyss Fabric, Enya in a beautiful duck egg blue. 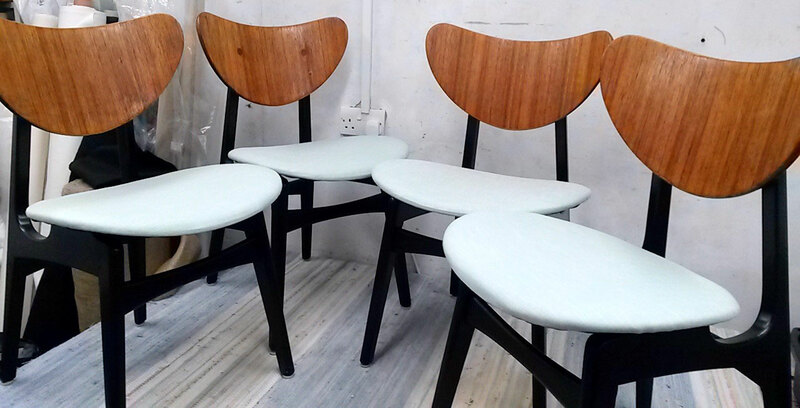 4 restored stackable Gomme chairs from 1976. Chrome frames, teak arm rests, new sustainable padding and covered in 4 mouth watering BUTE Fabric tweeds. 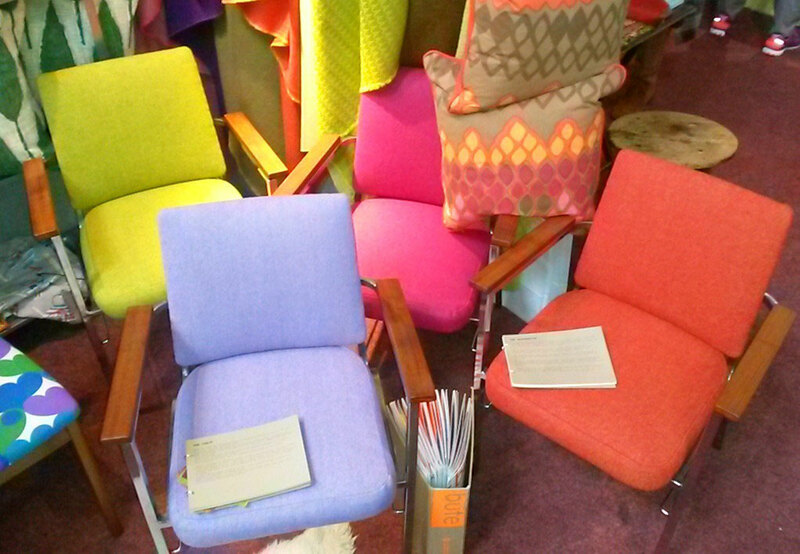 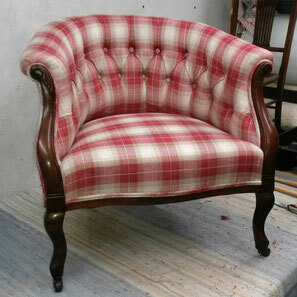 Re-covered in Morris & Co fabric - very in-keeping with chair design. 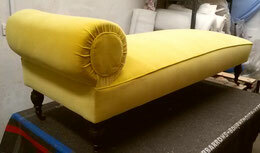 An unusual settee - thinking early part of 20thC - partial conservation and covered with Moyarta velvet by Designers Guild. Also made a pair of pleated bolsters to sit in the arms. 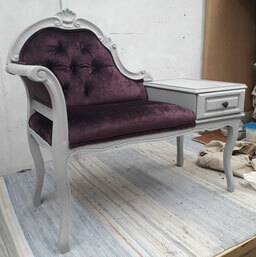 Complete re-vamp for this telephone bench. The wood was painted in Annie sloan chalk paint 'Paris Grey' and the upholstery is Wemyss Fabrics gorgeous Ashton velvet in Aubergine. 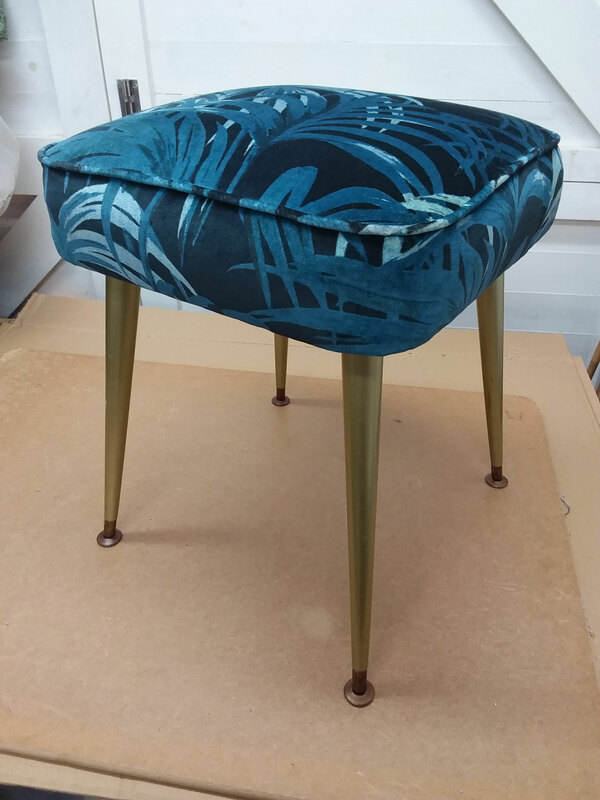 Another iconic mid-century piece - this stool was rebuilt and covered in House of Hackney stunning palm print velvet. 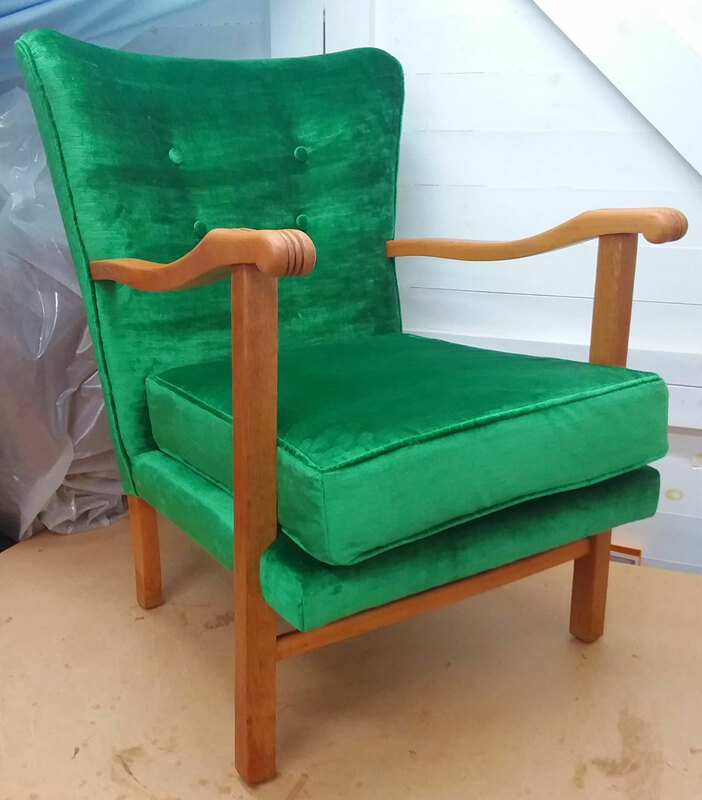 Lovely Art Deco armchair - one of a pair - rebuilt and then covered in Harlequin Arkona velvet in very fitting sea green/grey. Outdoor hinged cushion made with reticulated foam and outdoor fabric. 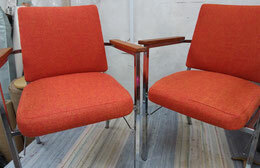 The hinge element allows it to be folded in half for storage. 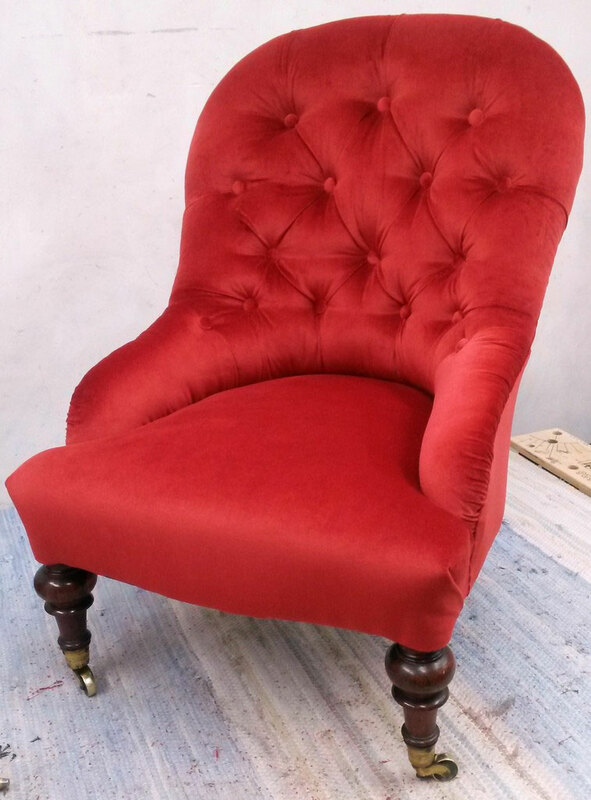 Dainty Victorian Iron Back chair. The hooped back is made from metal rather than wood. All materials have to be sewn on to the frame once it's tightly wrapped in calico. 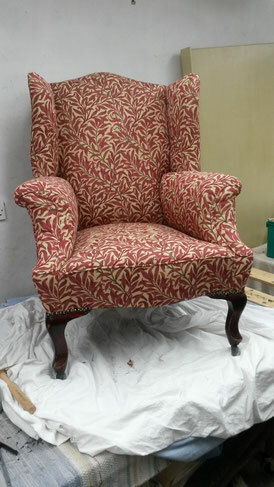 A looong job, but worth it! 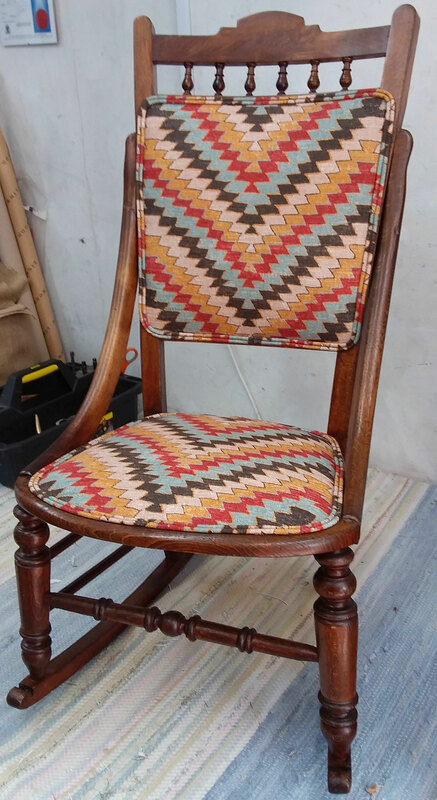 Modern open arm chair with zig zag springs on the seat. 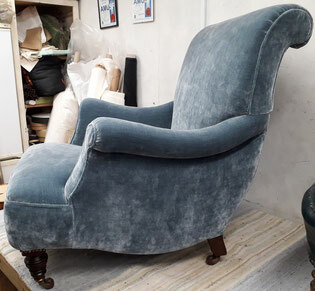 Completely re-built including new springs and foam. Covered in blue & white Arts & Crafts inspired linen. Cute little bedroom chair with sprung round drum seat. 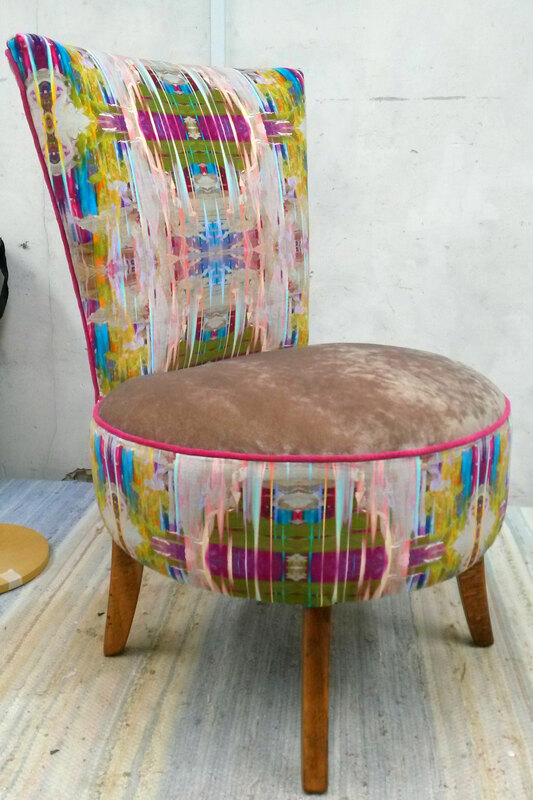 Parker Knoll from 1951 restored and covered with BUTE contemporary wool fabric and Heals "Starburst" vintage fabric on outside back, cushion and piping. 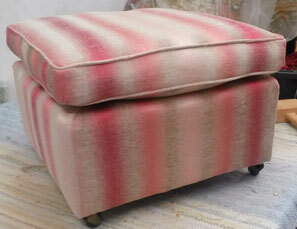 Pouffe with attached cushion recovered with Jim Dickens muted stripe fabric in shades of pink. 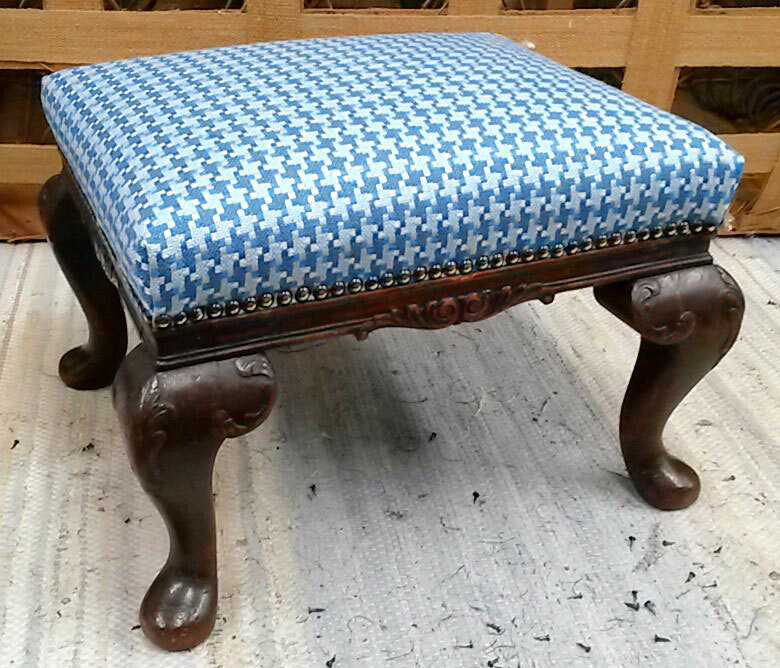 Almost too pretty for a foot rest! American walnut rocking chair, frame revived and waxed with new upholstery including original 1950's ship themed barkcloth as top cover. Buttoned Back Edwardian Armchair in pewter velvet. Very elegant chair. 1950's Cocktail/Bedroom chair restored and reupholstered in trio of velvets including the fabulous Parris Wakefield Additions 'Chance' complemented with a minky grey and dark pink piping. 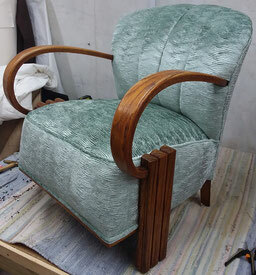 The legs were stripped, sanded, stained teak and oiled. 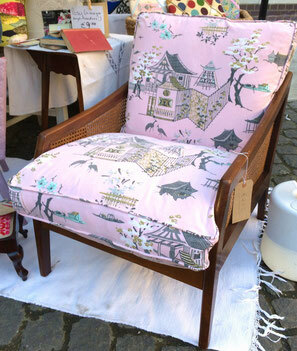 Feather cushions covered in original very pretty 1950's oriental themed print cotton. Fully restored, re-sprung and upholstered in lime BUTE wool with vintage 'Mayfield' by Moygashel on reverse. Studded leather armchair - completely rebuilt and restored with new hide and brass upholstery nails. Beautiful Edwardian tub chair - one of a pair - with button back and sprung seat. 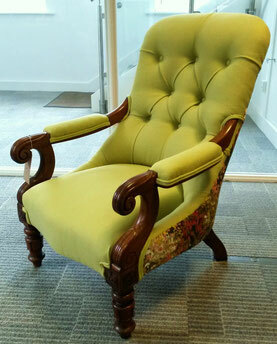 Found signature on seat rail from original upholsterer:- "G Eldon, June 1904". 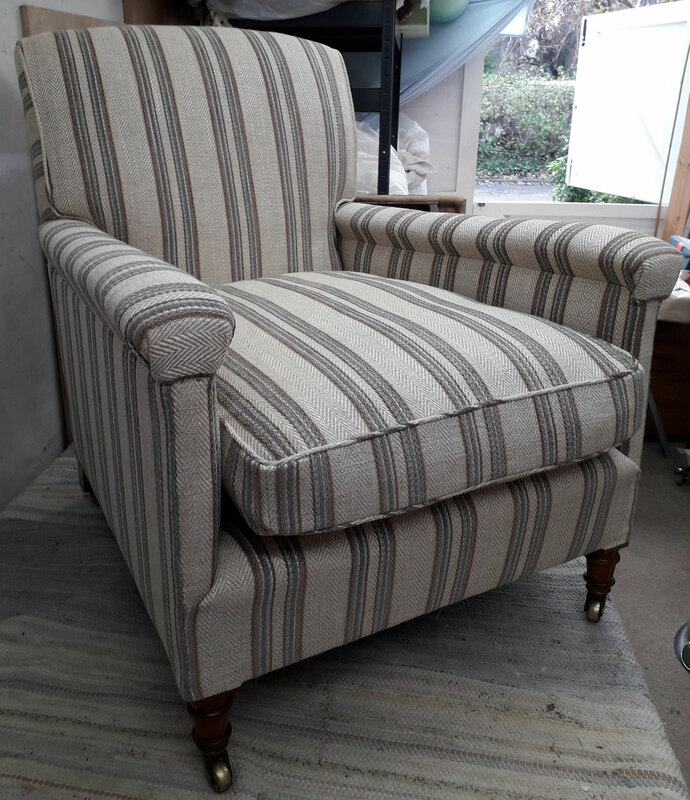 Revived and re-upholstered in Ian Mankin linen plaid. Unusual low settee with legs painted in Annie Sloan and slightly distressed. 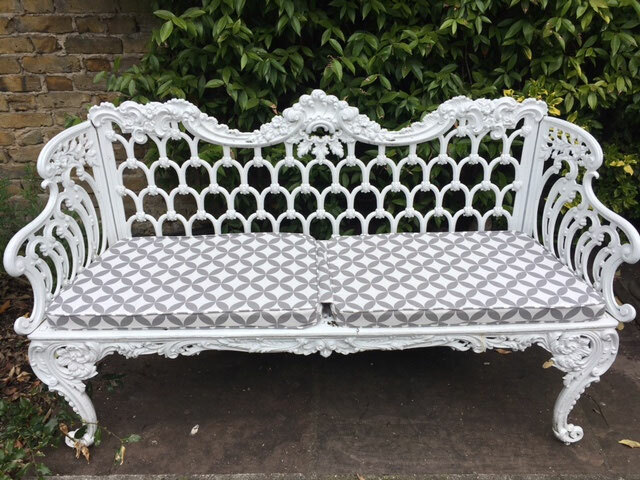 Covered in a bold grey & white geometric linen. 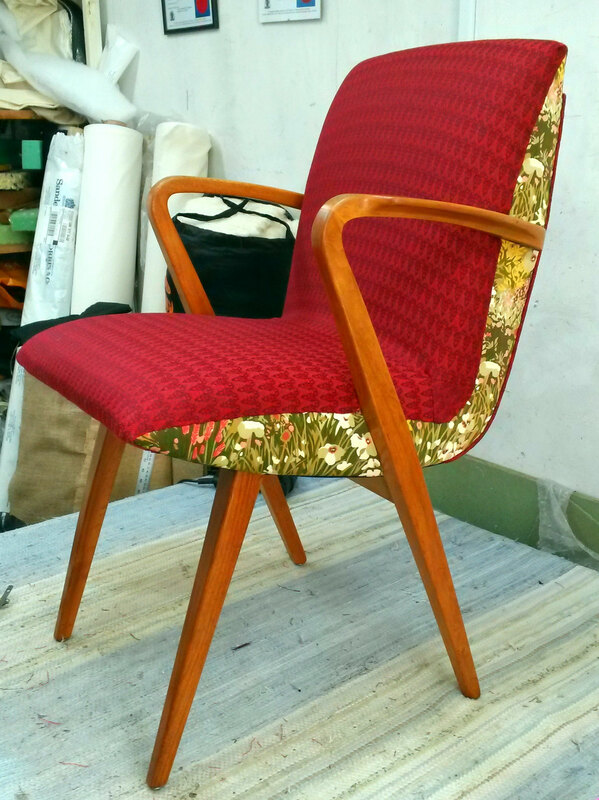 1950's Bridge chair; wood revived and waxed then reupholstered with new rubber webbing, foam and wadding. 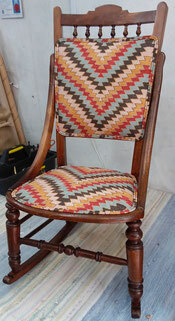 Finally recovered with BUTE fabrics 'Ramshead' and vintage 'Mayfield' by Moygashel. They'll not be another quite like this out there!